For years, LIUNA and other union members have helped in the rebuilding of the World Trade Center. Now 12 years after the September 11 attacks, One World Trade Center is nearly finished. 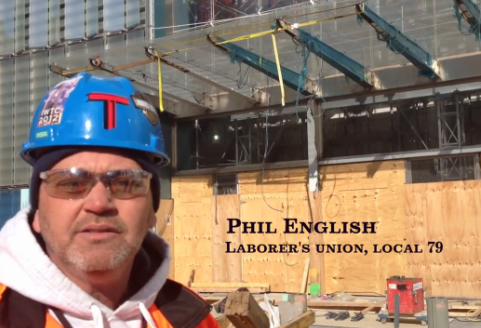 The Los Angeles Times highlights the story of LIUNA Local 79 member Phil English who has spent the last few years both rebuilding his life and One World Trade Center. Before English started working on the tower in 2007, he was at one of the lowest points of his life. His wife had just died and he was struggling to raise their three children. But then he got a gig at the World Trade Center site, and spent hours breaking up concrete, shoveling debris, emptying garbage bins — work that distracted him from his grief. Now, the tower is almost finished, and English has rebuilt his life slowly, step by step, just as he helped rebuild the tower. New York has rebuilt itself too, and the site that has been ground zero for more than a decade will finally take on a new name: One World Trade Center. Read Phil’s entire story in the Los Angeles Times.